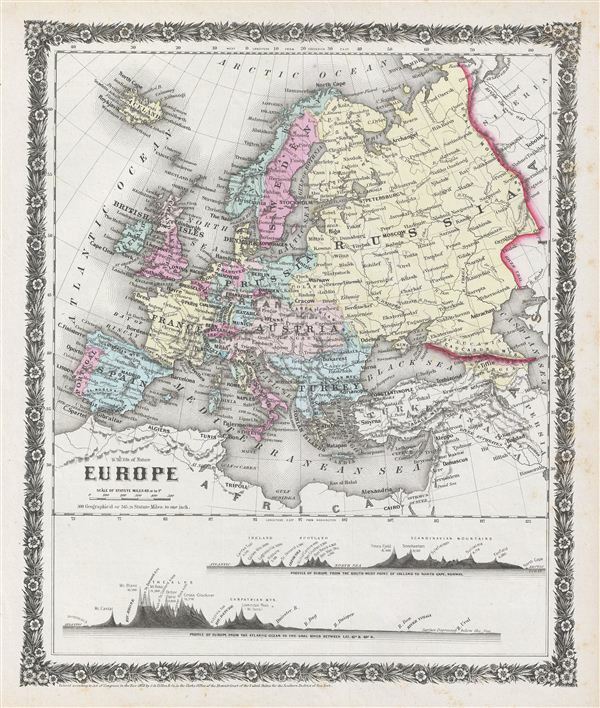 A rare example of Colton's 1858 map of the europe. The map covers the continent in its entirety from the Atlantic to the Caspian Sea and from the Arctic Ocean to the Mediterranean Sea. It also details Iceland and parts of Turkey in Asia. Shows the Austrian empire at its height, the many states of the German Confederacy, and a pre Garibaldi Italy split into numerous small Duchies and states. Notes the legendary and semi-mythical whirlpool known as the Maelstrom (Malstrom) in northwestern Norway. The bottom of the map contains two land elevations profiles, one of europe from the south west point of Ireland to North Cape, Norway, and the other of europe from the Atlantic Ocean to the Ural River. Divided and color coded according to country, marks major towns and cities, rivers, mountains. This beautiful hand colored map is a copper plate engraving, featuring a delicate floral style border only used by Colton in this particular atlas. It offers fine detail throughout with elevation rendered by hachure. This map was created at a time in history that witnessed the unification of Italy and saw the British empire rise to its peak. It was also a time of decline for the Ottoman empire. Dated and copyrighted to J. H. Colton, 1859, this map is by G. Woolworth Colton and the text is by Richard Swainson Fisher. Published from Colton's 172 William Street Office in New York City an issued as part of the1859 edition of Colton's Illustrated Cabinet Atlas and Descriptive Geography. Colton G.W., Colton's Illustrated Cabinet Atlas and Descriptive Geography, 1859. Very good. Blank on verso. Minor stains on margins.